China's experiment in human living for space exploration is going smoothly, halfway into the project, the Astronaut Center of China (ACC) announced Tuesday. Four volunteers started a 180-day experiment in June in a sealed space capsule, testing technology that will be used in deep-space exploration. The experiment examines how oxygen, water and food can be used and reused in space. The ACC has used Mars time with 24 hours and 40 minutes in a day in the experiment since Aug. 26. Scientists are also examining the physiological changes and emotional fluctuations brought by a hermetic environment. A total of 25 kinds of plants in the capsule as part of a larger ecological treatment system are also growing well. The experiment will conclude on Dec. 13. Four Chinese volunteers have completed a 180-day human space survival experiment. 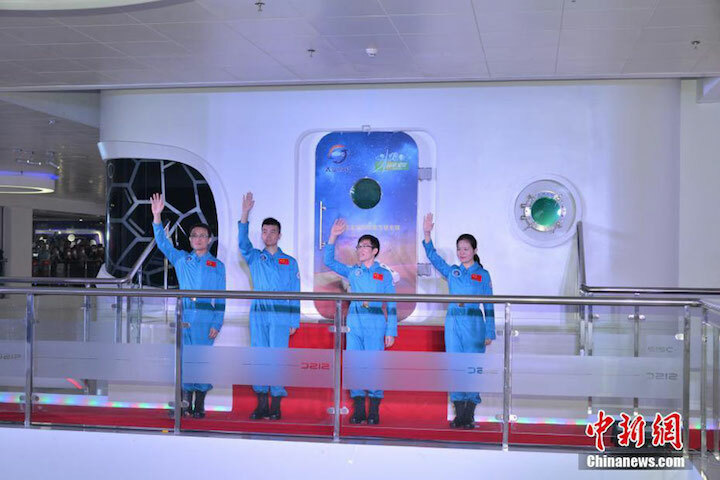 The four scientists -- three men and one woman -- had been living inside a sealed capsule in south China's Shenzhen since June 17 and emerged on Wednesday morning. They will receive medical checks and data collection will also continue inside the capsule over the next month to ensure the credibility of the data. The experiment was designed to determine how well food, water, and oxygen can be used and recycled under controlled conditions. The test of the "controlled ecological life support system" was inspired by technology currently used in China's Shenzhou spacecraft. The sealed capsule has floor space of 370 square meters and is divided into eight compartments, including living quarters, space for storage and the greenhouse. The volunteers cultivated 25 different kinds of plants inside the capsule, including wheat, potatoes, sweet potatoes, soybeans, peanuts, lettuce, edible amaranth and Chinese cabbage. The plants are part of a larger ecological system that helps recycle and regenerate oxygen and water, and will reduce the dependency on outside supplies. Team doctor Tong Feizhou says they're trying to ultimately create a balance where a sealed pod could eventually become self-sustaining. Outside of the sealed capsule, other scientists are also monitoring and observing how a hermetic environment affects people's physiological health, biological rhythms, sleep patterns and psychological health. As one might expect, the results of the experiment are considered critical to determining the viability of long-term space travel. Four volunteers on Wednesday emerged from a 180-day long sealed space survival experiment, designed to assist China's plans for future deep space human exploration. The three men and one woman participated in the 'Space 180' experiment to help determine how well food, water and oxygen can be used and recycled under controlled conditions. The project was run by the Astronaut Centre of China, with the life support system inspired by technology currently used in Shenzhou spacecraft. 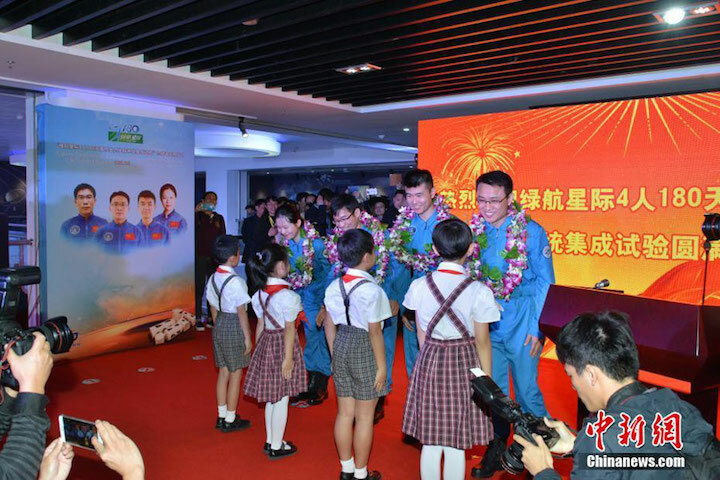 The chosen four exited the 1,340 cubic metre environment in Shenzhen to be greeted by scientists, who have been tracking their progress over the six months. Tang Yongkang, volunteer team leader, told press that he was "feeling relaxed right now" after finishing his responsibilities. "Our team is great. Together we finished the task through hard-work and with encouragement and support for each other. We are the best," Tang said. In a reflective mood, Luo Jie said: "During the task, I gained the most important experience of my life. I also made a lot of friends who are full of wisdom and energy. Thank you." With more immediate concerns on his mind, Wu Shiyun said: "I want to take a hot bath and have a grand meal of seafood," CCTV reported. Tong Feizhou said she hoped there can be fresh vegetables in space in the future. Above: The volunteers sign a Space 180 poster after completing the experiment. The volunteers had enter the space, consisting of eight compartments, including those for passengers, resources and a greenhouse, on June 17. Inside, the volunteers cultivated 25 different kinds of plants, including wheat, potatoes, sweet potatoes, soybeans, peanuts, lettuce, edible amaranth and pak choi, or Chinese cabbage. Scientists then monitored and observed how a sealed off environment affected their physiological state, biological rhythms, sleep patterns and psychological health. 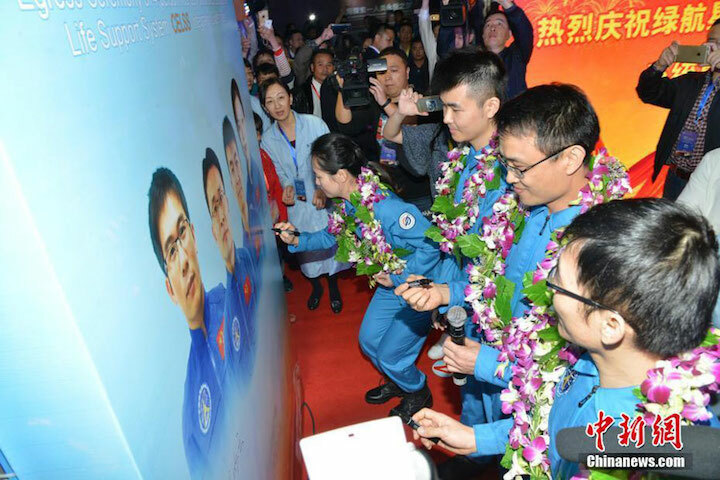 The participants used the same cardiovascular diagnostic system as used by Shenzhou-11 astronauts Jing Haipeng and Chen Dong in the recent mission aboard the orbiting Tiangong-2 space lab. The volunteers also engaged in exercise, including running on a treadmill and tai chi during their isolation. Above: Space 180 volunteers practice Tai Chi (CCTV+). More than ten domestic and international institutions are involved in the experiment, including the Astronaut Centre of China, Harvard University and the German Aerospace Centre.